This independent report of the Mental Health Taskforce sets out a strategic approach to improving mental health outcomes across the health and care system, in partnership with the health arm’s length bodies. It prioritises prevention, access, integration, quality and a positive experience of care. During the development of the strategy, the taskforce sought the expert input of people with personal experience of mental health problems, families, carers and professionals as well as reviewing clinical and economic evidence. Over 20,000 people gave their assessments of what works well, what doesn’t and suggested how to tackle some of the challenges – including the stigma that too frequently prevents people going to get the help they need. 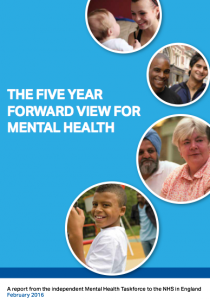 The report makes a set of recommendations for the six NHS arm’s length bodies to achieve the ambition of parity of esteem between mental and physical health for children, young people, adults and older people. The report also sets out recommendations where wider action is needed and places a particular focus on tackling inequalities.